We would like to implement the Global Healing Response for the victims of Sandy Hook and the community of Newtown, Connecticut. We are thinking the following materials could be added to Solstice, Advent, and other walks that have been planned for the season. Of course, feel free to plan a walk for the sole purpose of grieving and healing for this global tragedy. Linda Mikell (the US Northeast Regional Rep) and I (putting on another hat- the Veriditas Regional Rep coordinator) have reached out to the facilitators in Connecticut and let them know the labyrinth community is here for them and would like to help them offer healing. Attached is a beautiful poem (Sandy Hook Poem) written by Lea Goode Harris that was previously shared on the list serve. Please print and use as a handout at your event. Thank you, Lea! Duncan Newcomer created this wonderful flyer/poster (SandyHookRachelWalk) that can also be used. …As I prayed the Liturgy the phrase Holy Innocents came into mind; how disconcerting it is that just after Christmas the children whom Herod killed to find Jesus are remembered. All I can think of are the lyrics of the song: “my love is stronger than your fear, and I have promised to be always near”. My husband Ray wrote in his Blog “Changes” that God doesn’t ‘allow’ these kinds of events to happen, that She is grieving with us. If we respond with love and forgiveness (not acceptance) we could very well generate the kind of tipping point we want in GHR. Finally, this tragedy has shaken all of us. I ask you to be kind to yourself. 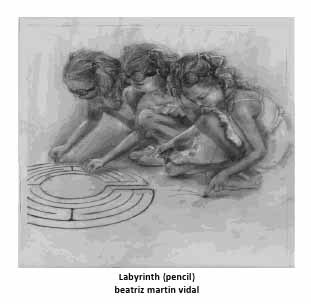 We have a wonderful community in Veriditas—let’s open our circle and envelope those who might begin to heal on the labyrinth. Blessings to you as you are a catalyst of peace, healing and love during this time of pain and fear. As a co- founder of the non-violence movement Sacred Ground in Chicago, I’m sad the prophecy by many that “gun violence is like a fire that spreads” is coming true. Perhaps our work can change that, too. This entry was posted in Disaster: Mass Shooting, Response: 2012 Sandy Hook Shooting by ellenmeuch. Bookmark the permalink.